BHN Offshore Company Pvt. Ltd.
For any Institution to be successful, it should have dedicated and highly motivated employees. To this end all our employees regularly undergo extensive training to upgrade them to the latest trends in shipping industry. We are a Crew Manning Agency, which selects, recruits and delivers seafarers to its clients (ship owners and ship management companies). 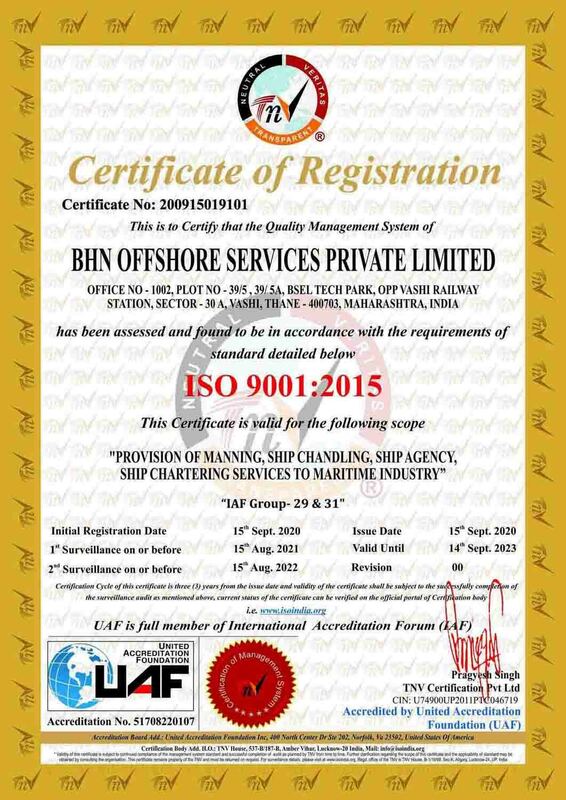 We are a reputable company in Mumbai, duly established and licensed by Director General of Shipping, and have been successfully engaged in crewing business on the international market since 2001. Our company has Quality Management System developed and implemented, which was certified by the world's leading classification & inspection authority, BM Trada / UKAS. Every Officer / Crew undergoes extensive screening before being hired. • Documentation checks are carried out. • References from previous employers verified. • Thoroughly interviewed by head of Fleet Department and Crew Manager. • We take care of complete crew documentation including providing assistance in making Passports and CDC. • Undertakes all formalities for required Visa application. • We arrange crew travel including arranging for Sign on/ off and repatriation. • Compliance of Safe manning requirement of the Flag Administration. • Experience in operating / handling of similar vessels for Deck officers and Deck crew. • Experience in operation and maintenance on similar Engines and equipments fitted onboard for Engineers and Engine Crew. • Medical examination for fitness onboard the vessel. • All personnel travel documents valid for the period of employment. • Compliance of Statutory requirements i.e. I.Tax, P.F., and other as per NUSI, MUI agreements. Our aim is to provide high standard quality crew to principle owners in the global scenario and to reach to the maximum Ship owners / Management throughout the world. We provide quality crew to our customers so that they can concentrate on other aspects of ship operation with ease. We manage the Human Resource Department with dedication on behalf of our customers. We offer total crew management for all ranks, for all types of vessels and Rigs around the world. We also supply experienced Divers for any kind of work. We ensure good coordination between the Crew, Owner and Management. We select best Indian crew, which have got good reputation and demand in international market. We select crew holding Stcw-95 Convention Certificate and Valid License and are fluent in English. The officers and crew are selected on the basis of their competency experience, good health and on their moral conduct. Under our policies only such officer /crew who fulfill IMO STCW Criteria are only eligible to apply. We have database of professional Seafarers, from which we select appropriate candidates as per requirement of our Principle Owners. The bio data of candidates are thoroughly screened by checking past employment reference, we also check their Competency Certificates and STCW courses. We scrutinize bio data and then we forward same to our Principle Owners for their ready reference and approval.